Our stud consists of the stallion Zibaq Khan and five purebred mares, four of whom have been bred at the stud. We endeavour to breed Arabians which are attractive athletes. Over the years we have enjoyed breeding some lovely stock by our stallion QUASSA and his son ZIBAQ KHAN and gain a lot of satisfaction from sharing their success for their new "families". Some of the blood is rare here in New Zealand. For instance, QUASSA was the only entire by the English Champion Desert Shadow imp UK (Desert King - Autumn Shadow). 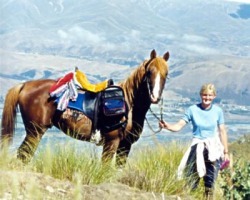 Desert Shadow was a beautiful chestnut stallion imported from the UK and a multi champion show horse. His dam, Autumn Shadow (Bey Shadow x Nasim) was one of three full sisters, Velvet Shadow and Crystal Shadow being the other two, who created a dynasty of beautiful stallions who have gone on to be very influential thoughout the world.